We know that instead of partnering with our emotions, we often dance away from, around, against, and beside our fear, our anger, our sadness, even our joy. What if instead of denying our emotions, resisting them, or persisting with them we could learn to move with and through them to become more fully embodied, creative, loving expressions of our souls? In this workshop we will explore how we are moved by Fear and how Fear moves us. 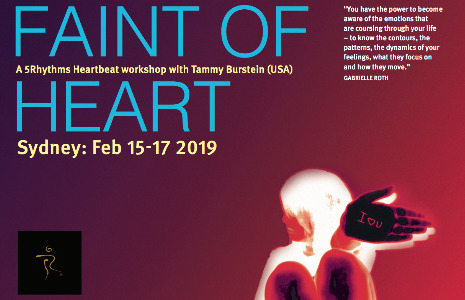 Using the Heartbeat map of the 5Rhythms we will investigate our relationship to how we receive and respond to Fear in our lives, are we afraid to be afraid, do we respond to fear with anger, dissolve into tears, invite the excitement of fear, see it in each other with compassion? Join us as we enter into the river of Fear and let her current open our hearts. Pre-requisite: 12 hours of Waves classes or workshop. This workshop counts towards 5Rhythme Teacher Training prerequisites.